For a long time now, researchers have been trying to apply something called “gene therapy” to Parkinson’s disease (and other medical conditions). Gene therapy basically involves introducing a new piece of DNA or replacing a faulty piece of DNA within a population of cells. DNA, as you may remember from high school science class provides the instructions for making proteins in the a cell and these proteins are the bits that actually do stuff. By introducing a new piece of DNA into a cell, the cell can start to produce a protein that it may not normally produce. Or it may have previously produced the protein, but because the genetic instructions (the DNA) for that protein had a small error (a genetic mutation), a non-functioning version of the protein was actually being produced. A good example of this gene therapy approach is Oxford BioMedica‘s product called ‘Prosavin’ (or OXB-101). Prosavin is a virus that was injected directly into the brains of people with Parkinson’s disease. I’m sorry did you say “a virus”? Injected directly into the brain? Generally, gene therapy approaches have involved the use of viruses for delivering the new DNA. These genetically modified viruses have had all the disease causing component removed, allowing us to use the virus as an efficient biological delivery system. Viruses by their very nature are very good at infecting cells, so if we remove the disease causing components, what is left is a very effective courier. Taking this approach one step further, we can take genes involved with dopamine synthesis and insert them into an empty virus. By then injecting this virus into the brain, we could produce dopamine in any infected cells (it’s slightly more complicated than that, but you get the basic idea). The scientists at Oxford Biomedica used their virus to transfer three genes (aromatic amino acid dopa decarboxylase (AADC), tyrosine hydroxylase (TH), and GTP-cyclohydrolase 1 (GCH1)) into cells in a region of the brain called the striatum. These three genes are all critical in the production of a chemical called dopamine – the chemical that is lost in Parkinson’s disease. The striatum is where dopamine producing neurons release most of their dopamine, but in Parkinson’s disease the dopamine neurons gradually die off, resulting in less dopamine. This reduction in dopamine levels is associated with the appearance of the motor features observed in Parkinson’s disease. The scientists at Oxford Biomedica were hoping to reprogram cells (that usually do not produce dopamine) in the striatum to start making dopamine, and that this reprogramming would result in increased levels of dopamine in the brain and less movement issues. The clinical study was an open-label trial conducted over 12 months at two research centres (France and UK). It was designed to assess the safety and efficacy of ProSavin after the virus was injected into the striatum on both sides of the brain in 15 people with advanced Parkinson’s disease. Both research centres were registered as separate trials at ClinicalTrials.gov (NCT00627588 and NCT01856439). ProSavin was found to be safe and well tolerated in the study participants. No serious adverse effects related to the virus (or surgical procedure) were reported, and significant improvements in the motor issues associated with Parkinson’s disease were found (the average Unified Parkinson’s Disease Rating Scale (UPDRS) score off medication in all of the patients at 12 months had improved from 38 at the start of the study to 27 (p=0·0001). Following the completion of the clinical study, Oxford Biomedica decided to move ahead with a more potent virus, known as OXB-102. Preclinical testing indicates that OXB-102 is at least five-fold more potent than ProSavin (based on behavioural and movement analysis). No clinical trial of OXB-102 has started yet, but the company hopes to start this year (Click here for more information regarding OXB-102). This sounds really fantastic. What’s could possibly be wrong with it? Well, this is one of the small success stories in the gene therapy world. And please remember that this was an open-label trial, the Prosavin product really needs to be tested in a double blind study. In this first study, there was very little difference between brain scans of dopamine processing before the study started and 6 months into the study – this may be one of the reasons why the company is seeking a more potent virus. Generally speaking, the gene therapy approach has demonstrated amazing results in preclinical studies in the lab, but the transition to the clinic has not been easy (click here for a good review of the field). The first clinical attempt at gene therapy for Parkinson’s disease involved injecting a virus containing a gene called glutamic acid decarboxylase (GAD), which is an enzyme involved in the production of a chemical called GABA. The virus was injected into an area of the brain called the subthalamic nucleus, which becomes over-active in Parkinson’s disease. This brain structure is a commonly targetted site for deep brain stimulation operations. By introducing GAD production in the subthalamic nucleus, researchers were able to reduce the level of activity, but the clinical trials for GAD only produced modest results. The virus was well tolerated, but the clinical effect was limited. Another clinical trial attempted to cause cells in the striatum to produce a chemical called neurturin (which is very similar to GDNF – we have previously written about GDNF, click here to read that post). The goal of the study was to prove neuroprotection and regeneration to the remaining dopamine neurons, by releasing neurturin in the putamen. Subjects were injected in the putamen with the virus and then the participants were followed for 15 months. Unfortunately, this study failed to demonstrate any meaningful improvement in subjects with Parkinson’s disease. I see. So what is the new research that could help this situation? She is an Assistant Professor of Biology and Biological Engineering at Caltech. In addition to exploring various aspects of brain functioning in both normal and disease state conditions, her lab produces new tools for studying the brain. She is particularly interested in using viruses to deliver genes into the brain. But please understand that she has no interest in the whole brain surgery approach. No sir, she wants viruses that can be injected in the arm (or consumed orally as a solution) and can then travel to the brain and infect specific groups of neurons. No expensive, invasive surgery. 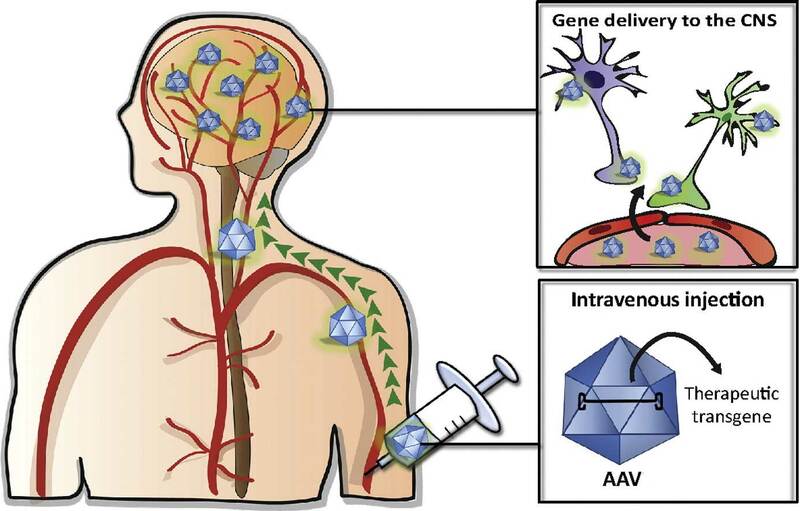 Just targeted gene delivery in specific cells in the brain using carefully designed viruses. Authors: Deverman BE, Pravdo PL, Simpson BP, Kumar SR, Chan KY, Banerjee A, Wu WL, Yang B, Huber N, Pasca SP, Gradinaru V.
Journal: Nat Biotechnol. 2016 Feb;34(2):204-9. In this study, Dr Gradinaru and her colleagues began by engineering a “library” (or pool) of many different Adeno-associated viruses (AAV). They were originally discovered in the preparation of another type of virus, called an adenovirus (hence the name ‘Adeno-associated’). They were believed to simply be a contaminant of that preparation. Further research, however, revealed that AAVs belong to the Dependoparvo genus of viruses, which in turn belongs to the family Parvoviridae. AAVs are single-stranded DNA viruses, and they are one of the smallest viruses (approximately 22 nm in diameter) with a non-enveloped capsid. The capsid is the shell surrounding the genetic material of the virus. Viruses are either enveloped or non-enveloped. “Enveloped” means that a second casing surrounds the capsid, providing further protection for the virus, while “non-enveloped” viruses have only the capsid. Given the reduced amount of casing, non-enveloped viruses are generally more virulent (more infectious) than enveloped viruses (a good example of a non-enveloped virus is the influenza virus). Non-enveloped viruses do not survive outside of an organism for long though. The AAV capsid (or outer shell) is composed of 60 proteins (as illustrated in the image above). There are at least 11 types of AAV (AAV2 being the most commonly used in research), and researchers can mix-and-match capsid proteins between the 11 different types of viruses to alter the infection characteristics of the viruses. Because the capsid is the first part of the virus to come into contact with cells, by making small changes to the proteins making up the capsid of a particular AAV, researchers can influence which kinds of cells the virus prefers to infect. And this is exactly what Dr Gradinaru and her colleagues did in making their large pool of different AAV viruses. They randomly altered the capsid of each virus in a way that Dr Gradinaru and colleagues hoped would allow the virus to pass through the blood-brain-barrier (the protective membrane covering and protecting the brain). They next injected these viruses into mice and one week later looked for AAV DNA in the brains of these mice. This analysis resulted in 13 AAVs that demonstrated robust ability to enter the brain and infect cells. One of these viruses in particular, AAV-PHP.B, represented approximately 25% of the viral DNA in the brains. The researchers next put a green fluorescent protein in the viruses. When the viruses infected a cell, that cell would turn green – providing the investigators with a rapid system of determining which cells are infected. When they looked at the level of green fluorescent protein activation in the control virus (AAV9) treated brain compared to the AAV-PHP.B infected brains, they found that AAV-PHP.B exhibited an enormously higher level of infection (for example, 40-times higher in the cerebral cortex region of the brain and 92-times higher in the striatum). And here is the really interesting result: The investigators found no significant differences in the levels of infection between the two viruses in the organs outside of the brain (such as the liver, heart, skeletal muscle and kidneys). The researchers had found a virus that seemed to have a strong preference for infecting brain cells. Authors: Chan KY, Jang MJ, Yoo BB, Greenbaum A, Ravi N, Wu WL, Sánchez-Guardado L, Lois C, Mazmanian SK, Deverman BE & Gradinaru V.
Just 18 months after the publication of their first research report, Dr Gradinaru and her colleagues have now published new findings based on two novel viruses, AAV-PHP.eB and AAV-PHP.S, which efficiently infect cells in the brain and spinal cord, respectively. Again the researchers put a green fluorescent protein in these viruses. Next, the researcher compared AAV-PHP.S with the control virus (AAV9), and they found that AAV-PHP.S very efficiently infected just the spinal cord while the AAV9 control virus infected very few cells in the brain (see the image below – the white line indicates the outline of the mouse brain as seen from above, with the spinal cord leading away to the left of each panel). To improve on this amazing technology, the researchers in engineered the AAV-PHP.eB virus further so that the green fluorescent protein would only be activated in the cells that they wanted it to be activated in. To demonstrate this, they designed a version of the AAV-PHP.eB virus that would only activate the green fluorescent protein in a region of the brain called the cerebellum (towards the back of the brain – see left panel on the image below). And taking this approach one step further, the investigators made sure that the green fluorescent protein was only activated within a particular type of cell in the cerebellum (those cells are called purkinje neurons). As the image below demonstrates, they could achieve this goal with impressive efficiency. Of particular interest to the Parkinson’s disease community, the researchers also demonstrated this remarkable cell-type specific approach with dopamine producing neurons (the cells that are badly affected in Parkinson’s disease). Understand that most of the cells in the brain are infected with the AAV-PHP.eB, but the virus can be designed so that the genetic cargo that it is carrying is only activated in certain cells (such as dopamine neurons). This property opens up a lot of options for us when considering this technology for therapeutic purposes. How could we use this technology in therapy? For example, after being diagnosed with Parkinson’s disease, a virus containing the DNA instructions for making a beneficial chemical like GDNF could be delivered specifically to the cells that are affected in Parkinson’s disease, in an effort to protect those cells and keep them alive. In other words a neuroprotective approach to Parkinson’s disease. Alternatively, before being diagnosed with Parkinson’s disease, you may become aware that you have a tiny genetic variation in every cell of your body that could make you susceptible to this condition. A virus targeting just brain cells could be injected into your body. That virus could contain the instructions for the correcting that genetic mutation, thus correcting most of the cells in your brain and limiting your chances of developing the disease. A gene editing approach to Parkinson’s disease. Or in more advanced cases of Parkinson’s disease, perhaps a virus could be injected into the arm of a subject and that virus travels to the brain where it re-programmes astrocytes to become dopamine neurons – replacing the cells that have been lost in the condition (Click here to read a previous post about re-programming cells in the brain). This would be a cell replacement approach to Parkinson’s disease. The options are basically limitless. Imagine in a not so distant future that you could visit the hospital and be injected in the arm (or swallow a solution) with a virus that will enter your body, travel to your brain and it helps to protect your dopamine neurons. The virus will be designed specifically to target those cells and no others. This is the holy grail for the gene therapy research – specifically targeted delivery system for any treatments. And the cargo being carried by the virus could be something supportive for the cells (like a neurotrophic factor like GDNF) or a gene editing system that can correct a genetic mutation in your DNA). Research being conducted by scientists at Caltech (and elsewhere in the world) is bringing us one step closer to making this future a reality. And the really good news here is, they are not the only research group that is screening viruses for their ability to infect specific cell types (unfortunately I can’t give names here without upsetting people, but understand that this is a hot area and lots of folks are working on it). We are not yet at the point of clinical trials, and they moving this technology into humans may take some time. But with the pace that the field is moving at the moment, I get the feeling that clinical trials for certain medical conditions won’t be far away. I’m 3 articles behind. Simon is on fire! Thanks again. Thank you for another very interesting and informative article. I was wondering if there was any possibility of combing this research of viruses that preferentially enter brain cells, and the research that you mentioned in an earlier article about LRRK2 inhibitors having negative effects on lungs? Could the viruses be used in the latter so that only neurones are affected? That’s a fantastic idea! I like the way you think. Rather than delivering an inhibitor though, the hope with the viruses is that they will be able to correct the actual genetic mutation (Gene editing), negating the need for the inhibitors. Thanks for sharing your idea – your comment really made my day because people sharing ideas is one of my hope for this website.